The 70904A module is used within the 70000 series system. 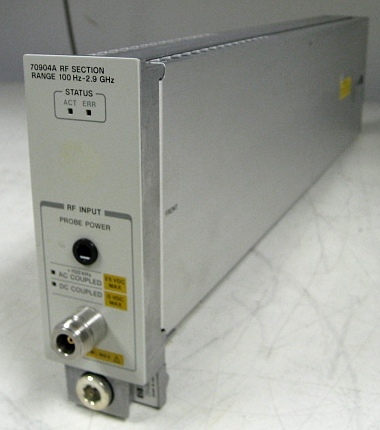 The Agilent 70904A RF section provides the 100 Hz to 2.9 GHz broadband input conversion for the Agilent 71100C spectrum analyzer and Agilent 71401C lightwave signal analyzer. The 70904A RF section contains an input attenuator and a mixer. The RF mixer converts the incoming RF signals to the intermediate frequency (IF) for further processing. The broadband, low noise mixer offers the performance needed to make high dynamic range measurements. The input attenuator can be automatically coupled either to the reference level for mixer protection or to the highest mixer level to maximize dynamic range. The input attenuator varies from 0 to 70 dB in 10 dB steps. Option H25 has 5 dB step attenuators. If you need to probe your circuit, you can drive the probe using the connection available on the front panel. High impedance probes, such as the Agilent 41800A and 85024A, are available. A buffered LO output is available to drive tracking generators or other modules such as the external mixer interface module.